Former Bomet Governor Isaac Rutto has asked election losers in the country to support those in power and stop fighting them. Rutto on Monday said there was a need for politicians to shelve their premature campaigns and instead focus on supporting those already elected to deliver on their promises. Reflecting on why he failed to realise most of the set agenda during his tenure, Rutto accused his political nemesis of sustaining the fight against him, saying it led to the jeopardy of several projects. Rutto faulted his inability to deliver on most of his pledges on the people who opposed his leadership style and those eyeing his seat. He assured current Governor Joyce Laboso of his support saying he will not fight her. William Hill, one of Britain’s leading betting brands, has launched a new advertising campaign this week featuring the unified world heavyweight champion Anthony Joshua (OBE). Joshua became a William Hill ambassador in 2018 but this is the first time he has been used in an advertising campaign by the company. Initially it will be a six week campaign building up to Joshua’s world title defence on 1st June in Madison Square Garden. “We’re really excited about AJ, our global brand ambassador, featuring in his first ad for us. “The story emphasises how William Hill want all our customers to enjoy their betting with us and celebrate the moments while staying in control. Woman offered Sh1 million to break up with fiancé - and she took itNot many of us could be bribed to break up with our significant other, but one woman has revealed that she did just that when faced with the choice. SEE ALSO :Top Judge demand to city lawyerShe begins by explaining that she met her partner in college and they dated for several years before he popped the question. However, after they got engaged, she began to notice that he was changing, and becoming increasingly like his parents. SEE ALSO :Suppliers accuse Kanjo of taking bribesThe woman decided then to start distancing herself emotionally from her partner and was getting ready to leave him. A third added: "I wouldn't leave my partner for 10 million, so it's not like you were gonna be in it for the long haul. And if we hear somebody saying that we have to go back, I do not know what we should do to that person” Magoha said. Magoha said by September, the government will be able to roll out the curriculum to the Fourth Grade. The training is meant to enable teachers to manage the new curriculum which will replace 8-4-4 system. He said the new curriculum will ensure that the standards of education in public and private schools are at one level. The study conducted between January and March further revealed that teachers were not sufficiently trained to teach the new curriculum. 25-year-old Red Cross volunteer Amina Bakari killed in Lamu25-year-old Amina Bakari who was killed by unknown people in Mbwanjumwali, Lamu East sub-county. Police in Faza are looking for unknown men who killed a Kenya Red Cross volunteer at Mbwajumwali on Monday night.Amina Bakari was hit on the head a she closed her shop at 10pm. According to area assistant chief Jaffer, Amina's attackers are believed to have disappeared immediately after attacking her. Kenya Red Cross representative Lamu court, Kawthar Mohamed, said that it is unfortunate to see such a young life lost adding that the late Amina was very useful in the area. Police sources in the area have launched a manhunt for the unknown attackers promising to bring them to book. By SAMMY LUTTAMore by this AuthorKenya has dispatched chiefs from Turkana to Uganda to woe more than 40,000 pastoralists from the county who crossed over in search of pasture and water to register for the Huduma Namba in the National Integrated Management System (Niims). Mr Wambua said a majority of them in far-flung areas, just like those in Uganda, do not have identification cards or birth certificate which are required for the Huduma Namba registration. DRY SPELLNormally, the pastoralists cross over to Uganda during the dry spell in Kenya and come back when the rains fall. “I ask everyone in Turkana to embrace the exercise so that the government knows of their existence. CHALLENGESThe Huduma Namba registration in Turkana has faced a myriad of problems ranging from poor network connectivity and insecurity. Peter Mbugua made headlines when he married Wambui Otieno, a 67-year-old widow in 2003. Well, that was not the end of Mbugua's life as he surprised many when he tied the knot on Monday to his spouse, Ms Anne Wangari Njuguna, 35. Wambui and Mbugua's marriage raised a lot of controversy and criticism with many claiming that the former stonemason was only after her wealth. In an exclusive interview with the Nation, Mr Mbugua stated that his first marriage was filled with controversy, especially after Wambui died. “When my wife, Wambui, died, I felt as if a part of me had gone with her. JUST IN: Sri Lanka terror attack warnings were ignored - including tip-off weeks earlierPolice clear the area around the bomb blast. SEE ALSO :52 dead as blasts hit Sri Lanka churches, hotelsThe warning of terrorist activity first emerged on around April 4. The PM, Ranil Wickremesinghe, admitted security services had been “aware” of possible attacks. SEE ALSO :Uhuru condemns Sri Lanka attacksAt least seven of the attackers used suicide vests, with Christian worshippers targeted. Interpol is deploying a team of investigators, including experts in disaster victim identification, to Sri Lanka to assist local authorities. A Kenya Red Cross volunteer was on Monday evening hacked to death by unknown assailants in Mbwajumwali village, Lamu East. Amina Bakari,30, was attacked using a panga as she closed her shop in the village at around 11 pm. She was a peer educator working with the Red Cross. All we know is that she was attacked by unknown people as she closed her shop,” said Kanyiri. Kenya Red Cross Society Lamu coordinator Kauthar Alwy said the organisation was saddened by the brutal killing of one of their own. By AMOS NGAIRAMore by this AuthorLegendary Congolese musician Lutumba Ndomanueno Simaro will be buried in Kinshasa on May 5, with a befitting State send-off planned. Their elder brother, Mr Jean Claude, has been coordinating arrangements back at the family home at Linguala in Kinshasa. TRIBUTE SHOWSVarious Congolese musicians have been staging tribute shows in Kinshasa dedicated to Simaro since his death after a long illness. According to the official funeral programme, Simaro’s body will be placed in the presidential palace for public viewing on May 4 before it is buried the next day. The government will cater for the costs and give him a state funeral. Are our investigation agencies sufficiently equipped to handle modern day economic crimes? So, most illegal transfers of money are made through the dark web where money laundering thrives in the form of Bitcoin laundering. Bitcoin laundering is a new form of money laundering that oscillates within the bitcoin network. Under the realm of bitcoin laundering are exchanges that facilitate the conversion of bitcoin into fiat currency. Specifically, there should be a concerted effort by investigation agencies to know how criminals are using bitcoin money laundering to sleaze a lot of money from Kenyan coffers. 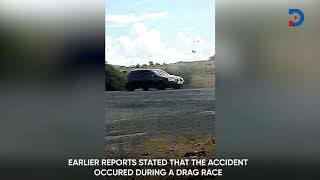 A video taken at the time of the Arusha car crash that claimed 8 lives shows the events leading to the crash and somewhat disapproves allegations that the accident occurred during a race. The drivers are said to have been in Oldonyosambu area, near Arusha, for a car racing event, however, according to the video, witnesses and Tanzanian authorities, the accident did not occur during a race. By OUMA WANZALAMore by this AuthorEducation Cabinet Secretary George Magoha on Tuesday assured Kenyans that the rollout of the new curriculum is on despite opposition from teachers union leaders. Speaking at Uhuru Gardens Primary School in Nairobi during the launch of training of teachers on the competency-based curriculum, Prof Magoha said there is no turning back and warned critics that they are only wasting their time. "I will personally take a leading role in ensuring that this exercise succeeds and I will not rely on reports," said Prof Magoha. The Kenya National Union of Teachers Secretary-General Wilson Sossion has been vocal against the replacement of the 8-4-4 curriculum, repeatedly warned that teachers are ill-trained. But Prof Magoha said there is no crisis because the sessional paper on curriculum reforms is before Parliament. “As from Tuesday, April 23, 2019, there will be no physical Order Paper that will from time to time be provided in the chamber,” Mr Muturi directed. “MPs will henceforth be able to access all documents from the application on the equipment,” he said. The use of the gadgets will ease access to the order paper, motions, Bills, petitions, Speaker’s rulings, proposed amendments to Bills and memoranda. National Assembly Clerk Michael Sialai said that the paperless solution will be implemented progressively starting with the order paper. It is not clear when the Senate will roll out its paperless solution but its debating chamber is already fitted with 68 tablets. By LOUIS MUIRURIMore by this AuthorClosing day is treated with the sensitivity of a busy day at the stock exchange market. NATIONAL IMPORTANCELuckily, our employers understand that closing day is a day of national importance, and you just need to mention to your boss that you will be attending closing day and you are waved away with a sympathetic look to go and take as much of your time as possible. What also strikes me is the access security enhancement during closing day. We never had the luxury of a perimeter fence or security guards at Karugo Group of Schools. This would involve some ad hoc contributions from the school’s caution money kit that had to be approved by the school’s board of directors.